Every Saturday, I host a feature called Kid Konnection -- a regular weekend feature about anything related to children's books. This week I'm going to share with you a terrific middle grade book by a Newbery Honor-winning author. Summary: Return to Al Capone’s Alcatraz with Newbery Honor-winning author Gennifer Choldenko in this charming addition to the beloved series about the son of a prison guard. Moose Flanagan lives on a famous island in California: Alcatraz, home to some of the most dangerous prisoners in the United States in the 1930s. It’s the summer before he starts high school, and Moose is going to play a lot of baseball and win a spot on the high school team. But he still needs to watch his special older sister, Natalie–and then the warden asks Moose to look after his two-faced, danger-loving daughter, Piper. It's been quite a few years since I read AL CAPONE DOES MY SHIRTS by Gennifer Choldenko with our mother/daughter book club. I remember loving it... as did all of the kids and moms in our group. If you're a member of a book club, you know how rare it is that everyone enjoys a book! I have always been fascinated by Alcatraz and Al Capone, so that's an added plus for me, but the books in this middle grade series are truly something special. The fourth book in the series, AL CAPONE THROWS ME A CURVE: A TALE FROM ALCATRAZ, has recently been released; and I have to say -- it's fantastic. I devoured this book last week on a rainy day, and I am honestly kicking myself for not reading the entire series. I love the characters and, of course, the setting; and Ms. Choldenko's writing is just so darn good. I believe that even reluctant readers will enjoy these books. AL CAPONE THROWS ME A CURVE centers around Moose, and thirteen year old boy whose family lives on Alcatraz Island. The story takes place during the depression when his father was "lucky" to have his job as a prison guard. Moose is a great kid with an awful lot on his plate. Moose would like nothing more to play baseball all of the time with his friend, and their goal is to make the high school team... which is unheard of for incoming freshman. However, Moose also has to watch out for his older sister Natalie who lives with autism and handle his mother's dark moods. To make things even more difficult for Moose, the warden asks him to look after his trouble-making daughter Piper. There is a lot of tension at Alcatraz too because the prisoners are threatening to strike... and that could have serious effects of Moose's father and his entire family! Moose has always been protective of Natalie, but it's becoming harder as she gets older. When Natalie turns seventeen, she receives a new haircut, a new dress, and new shoes... and she discovers that she enjoys looking pretty. She even develops a crush on a high school baseball player. However, the unthinkable happens when Natalie finds herself inside the gates of Alcatraz, and poor Moose has to go in to one of the most dangerous prisons in the country to save her! AL CAPONE THROWS ME A CURVE has it all -- wonderful characters, an exciting setting, and lots of action. There's even a little bit of baseball for those interested in the sport! The book has just the right blend of story and history to make it a fun and educational read, and there are even sections at the back of the book that explain the historical context of Alcatraz, Al Capone, and the "baseball." As a mom, I love so much about this book. One of the best things is that the book is entertaining while also touching upon some very serious topics. Moose's family (and Moose for that matter) is dealing with some major things including autism, depression, and financial issues. The book does a wonderful job of exploring these things in a compassionate, yet honest, way; and it really does allow children in similar situations to see that they aren't alone. 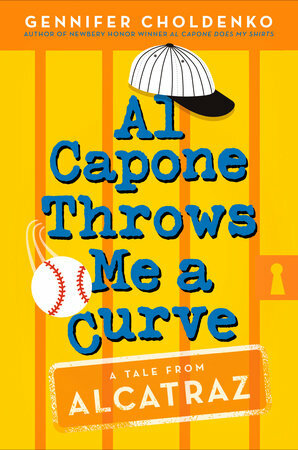 AL CAPONE THROWS ME A CURVE would be a great coming-of-age book to read in the classroom or for middle grade book clubs. Some of the themes you might want to explore include family dynamics, mental health, friendship, loyalty, staying true to one's self, special needs, responsibility, and honestly. I highly recommend this book and the other ones in this series! This sounds wonderful - I can't wait to read it. I'll have to tell my teacher friends about this series! Happy Mothers Day... to me!